Cricket fans are looking forward to watching this summer’s Ashes series on their mobiles, with one in three online video starts for the Ashes expected to come from mobile, according to new research. New research from Adobe examined social media buzz building up to the first match between England and Australia this week. Adobe Digital Index (ADI) analysed social media mentions around the Ashes from blogs, Facebook, Google+, Reddit, Twitter, Dailymotion, Flickr, Instagram, Tumblr, VK, Disqus, Foursquare, Metacafe, Wordpress, and YouTube. 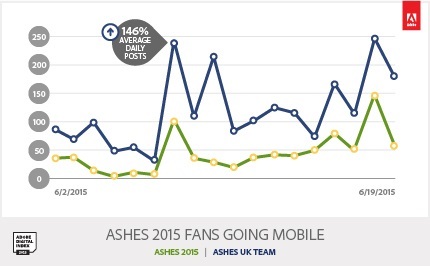 The analysis revealed that in the run-up to the series, 10% of the buzz had mentioned watching the Ashes on mobile. But when UK broadcaster Sky, which has the rights to live coverage of the series, announced that fans could once again watch matches live on the Sky Go app, posts related to the Ashes increased by 146%.